In my mind, my skin glistened in the sun. In reality, I was a sweaty mess! outdoor mojito drinking girl to do? That’s just what I did to get some instant gratification. 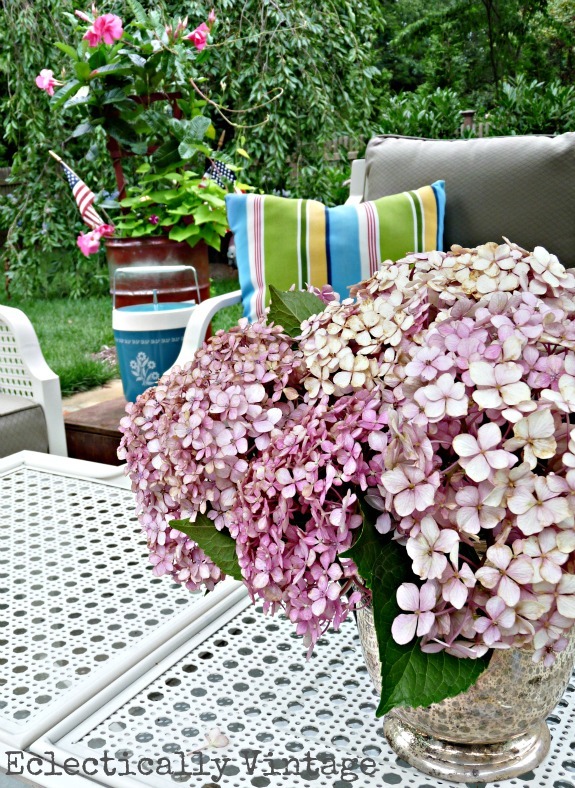 hydrangeas, mandevilla, geraniums, and of course there’s always room for my vintage gnome. What a difference a little shade makes! I still dream of a pergola to cover me while I rest my weary bones. 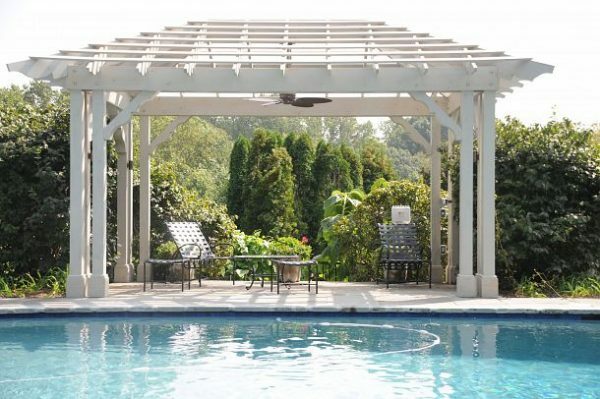 1) Pine Street Carpenters please come to my house and build this pergola asap (the pool wouldn’t hurt either)! 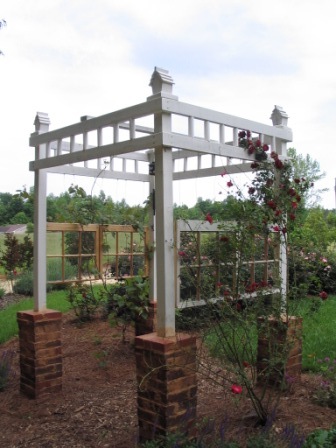 2) Valerie’s hubs built her this pergola – nominating him for world’s best hubby! 3) Faidra at CA Global created the most amazing outdoor area that I’d never want to leave. 4) Oh how I wish I could recreate this pergola in Diana’s yard. I’m loving the vintage windows too! 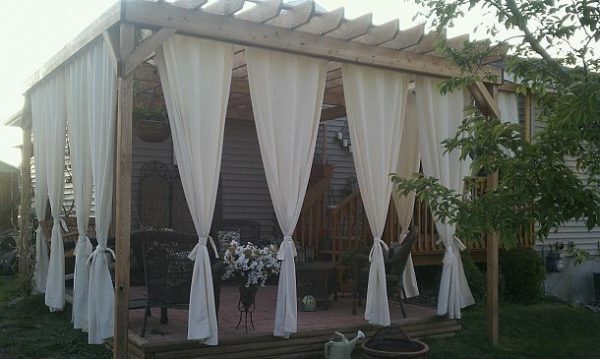 5) Stacy keeps cool in a pergola with drapes and a misting system! 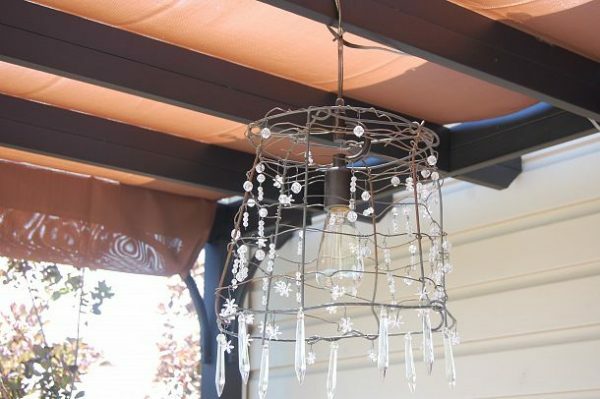 6) Serendipity Refined blinged out her pergola with some Pottery Barn knockoff lanterns. 7) And if I had my dream pergola, I’d hang a tomato cage lantern from it like Peggy from Pig Logs and Tater Berries did. 8) Dad, please make this arbored swing for my birthday like Deb’s dad did for her! and relief from the heat. 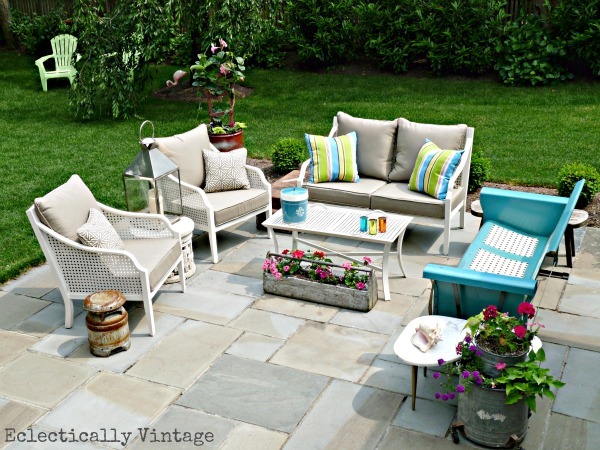 Love your patio and the inspiration pieces. And, getting on over to Hometalk is on my To Do list this next week. Try not to melt in the heat! I so need some pavers to cover up all the stinking weeds that keep infesting my gravel patio… Lovely spot Kelly! I want a pergola sooo bad, I dream of it at night…my nice patio had a wonderful shade tree for years and years..then, it died…and now we are in FULL sun. I NEED a pergola……..BAD ! I hear you BJ!! 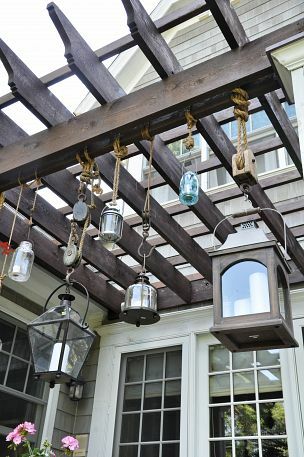 Get an umbrella til you can get that pergola up! I do love that giant umbrella you have, definitely need shade if you are going to lounge out of doors. Yours look so inviting, but it is so hot in the summertime where I live, I am heading over to Stacy’s house for that misting system. Good for my pores too. Yep. 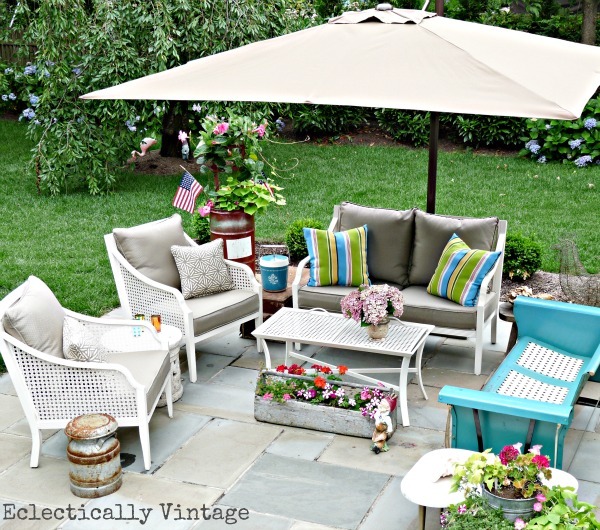 I could totally hang in your outdoor room, in the nice cool shade, with a mojito. Please? Oh Kelly, How awesome is your porch/backyard??? I love your style and taste. Thanks for sharing with us! I guess anything is for sale, right? Who knew you could just “buy” some shade … love that umbrella but have to agree that your patio space is just screaming out for a pergola! Ooooh…love your umbrella! We have a huge shade tree on one side of out patio, but if we didn’t, I’d be begging for a pergola too. The patio looks fabulous…perfect for mojito drinking! I love the mandevilla! This is the first year that I didn’t buy one…maybe I’ll have to hunt one down now! Wish I had gotten a better picture of the one I was under a few weeks ago for a team softball party – gorgeous and filled with wisteria vines, just the way it should be. Great group of inspiring pictures. Love your patio, looks so inviting. Back in Pa, I had a flagstone patio too and do miss it. Pine Street carpenters Sounds familiar,I think they are from West Chester where I used to live. Thanks for joining the party at Share the Love Wednesday!